Nurses came in to tell us they were going to need the room, so they were going to move us to another one where we could spend as much time with Catherine as we’d like. I remember thinking how nice that was and at the same time thinking, “Of course they need the room – they can’t just wait around for us.” Little did I know that that would be one of thousands, if not millions, of competing thoughts that were in store for me. Some bubbled up with cynicism; some with ache, some with unwavering hope, some with love, some with anger, some with confusion, some with dismay… the list goes on and on. That meant our next stop was room 12 – my favorite number and Brian’s. Catherine died in room 8. Sarah waited in room 7 – the number for perfection and completeness. And we said goodbye in room 12. Brian immediately wanted to hold her. He treated her as if she were alive. He talked to her and covered her up and made sure she wasn’t cold. “This all looks so normal,” I said at some point to someone. “We’ve held her a million times when she’s sleeping or out of surgery and she looks just like this.” I don’t think I ever said it out loud, but the implication was desperately waiting under the surface… “Are we sure she’s not alive?” I wondered. Maybe she was. I had to keep the hope suppressed, though. It kept wanting to fly up and carry me away, only this time there was nowhere to carry me. I finally determined that I wanted to hold her. She held much easier than she had in life. She didn’t resist or arch or push back with her own will. Instead, she snuggled. She curled. She fit exactly in the little pockets of my body that ached to have her fill. I’m so glad I held her. I wish I could still hold her. I wish I had held her more when she was alive. That was usually Brian’s role. He always held her best and she always loved to be in his arms. I think on that day, she liked being in my arms, too. I imagine her spirit floating above us like on the movies where they talk about near-death experiences. I imagine her watching us hold her and telling her how much we loved her and hearing me hum Brahms’s lullaby – the same one I’d hummed since the day she was born and nearly every single day in the NICU. Sometime – I can’t recall exactly when – the hospital chaplain showed up. He looked like Santa Claus. He had a fluffy white beard and I thought, “Wow, Sarah gets a visit from Santa Claus!” Since it was 20 days before Christmas, it made sense. Santa does visit kids in the hospital before Christmas. He said a nice prayer with us, expressed his regret that he hadn’t gotten there sooner, and we changed rooms for him to meet Sarah. I think I asked her, “Who does he look like?” How could it be that Brian was holding dead Catherine’s body a few rooms over and I was talking with Sarah about Santa Claus? Does that even make sense? Truth is that none of this makes sense. None of it! So, if the man looked like Santa Claus and I wanted to think of it that way, then so be it. I kept bouncing back and forth between Sarah’s room and Catherine’s room. I was used to that. That seemed normal. I’ve balanced the two of them for 10 years, so that felt productive and comfortable and safe. Plus, my doctor friend was hanging out with Sarah and that helped a lot. Her brother had died when she was young, so she knew what Sarah might be experiencing. She gave her some wise perspective, which she shared with me so I’d know. “I told her she’s going to feel sad at times and she’s going to feel happy at times and both are OK. And you don’t need to feel guilty for feeling happy. It’s OK to feel happy, too,” she explained. I’ve tried to hold onto those words for myself, actually. It’s hard. I feel incredibly guilty during the little moments where I start to feel happiness eek into my soul. For example, Sarah sang in her first solo performance at a restaurant the day after Catherine’s memorial service. She was really good. I was impressed she was able to get up there and pull it off given her lack of sleep and all the stress surrounding her. I was proud of her. And in awe, frankly. And I felt a little happy about it. As soon as I recognized it as happy, though, I felt guilt put a lid on it and push it away. “How can I be out watching Sarah in a restaurant when Catherine died less than 2 week ago?” Honestly, that feeling comes up all the time and it feels worse than most of the feelings I have right now. Eventually, during all the bouncing back and forth, my priest showed up. I had texted her when we were in the ambulance, and I guess she decided she needed to come. She was a welcome presence and she anointed Catherine which felt safe. I was holding Catherine when she leaned over to give me a hug and my ear got pressed against her chest. All I could hear was her heartbeat, loud and strong. This sound – or really absence of sound – juxtaposed the silence I had heard when I listened to Catherine’s chest to convince myself she was no longer alive. It was too much. I broke down into the loudest, strongest tears I had had in the moments since I had been told they were going to stop CPR. Catherine didn’t have a heartbeat any more. This woman did. And that was the difference in the rest of my life. That was the moment when I think it actually first really hit me. My 14-year-old baby was dead. I’m tired of training nurses. Perhaps I should view each new nurse as an opportunity for improvement. I do. I find that the perspective shift doesn’t remove the reality that I’m simply tired of it. Every time a new nurse starts, we wonder if she’s going to do a good job. And every time a new nurse starts, we have to train her on the big things like Catherine’s seizures and the little things like how I’ve arranged the clothes in Catherine’s drawers so it stays somewhat orderly. With each orientation, I open the drawer of Catherine’s dresser and show how her shirts are filed by color in an attempt to bring some order to what is inherently chaotic in our lives. Rarely are they as neat and organized as I want it done or I would do it myself. Yet I’m grateful for the help to put away her clothes, which the nurses certainly don’t have to do. I don’t feel like I can complain or correct. In fact, the order of her drawers metaphorically expresses the order in our lives – or not. Think about it… imagine having some random person in your home every single day of every single week of every single month for the past 9 years. We didn’t get nursing until Catherine was about 3 years old, and as much as I can’t conceive how our family would function without the help, it is a significant intrusion to have to accept. Brian and I could not work and go to school without a nurse helping us. It’s that simple. As nice and helpful and important as these people are, they are not part of our family. They are more like a growth on the side of our family. For example, even as I’m writing this, a nurse sits behind me finishing her report, and I’m mindful I need to turn and get report of Catherine’s night from her. I used to wonder if the agency trained them to think about the place they take in a family. Brian and I dampen our disagreements when nurses are here, though on occasion, they have heard us fight. He detests that and I don’t blame him. Imagine what it’s like to want to share joy with your spouse and see a nurse first instead. Think about a nurse being the first person you see after a bad day. I remember the days after I lost my job. Our nurse knew something big was going on and I didn’t want to share it with her. That’s a little odd to say the least. I mean, she was in our home every single day for hours! And she couldn’t really comfort me yet I’m certain she wanted to make me feel better. All nurses want to help. The truth is that they wind up a centerpiece of your life, and somehow they stay on the outside at the same time. So, when I think about training more nurses, yet again, it’s not just about the location of syringes and the physical manifestation of Catherine’s seizures. That’s the easy part. It’s about how we wind up absorbing them into the family. Even though they’re actually outside it. A couple weeks ago, I flew Southwest to San Diego for a training conference. I forgot to check in exactly 24 hours before the flight and when I finally did check in, my boarding number was C46 – clearly one of the last to board. That meant I’d definitely be stuck in a middle seat, probably in the back of the plane. Ugh! Brian kept telling me I should upgrade to A boarding. I didn’t have the same strong urge. Something told me it would be OK.
As I arrived at the gate and looked around at my fellow passengers, I saw a woman in a high-tech wheelchair. Once you have a wheelchair as part of your life, you start to notice the differences in them, and I could tell from this one that the woman was fairly disabled. It was a power chair, blue and I remember thinking that I hoped the airline would take good care of it. I also wondered if she were able to transfer or if they’d have to put her in the airline seat somehow. I know how we do it with Catherine. I was curious how it would work with a fully-grown adult woman. I’m also always mindful that looking at a wheelchair can be viewed as “staring” and we’re taught in this county, “It’s not nice to stare.” I always hear myself in my mind justifying my staring in case I get caught with something like this: “No, it’s OK. I have a kid with disabilities. I can look. I’m just looking at your wheelchair, comparing it to the one we have.” I realize that makes absolutely no sense. It’s what I think though. It’s like I get a pass. I’m a card-carrying member of the club. Naturally, she boarded early, and I waited my turn, resolved that I’d be sitting in a middle seat, hoping I wouldn’t be too far in the back. The middle AND the back would really bum me out because it would mean it would take a long time to deplane on the back end of the trip. And that drives me crazy. We spent the rest of the flight in our little cocoon of happiness. Her husband, sitting on the opposite aisle, tried to chime in at times. I was knowingly able to help her with her bags and iPad and she gladly let me. She was happy not to be the person no one wanted to sit beside, and I was happy to be up front. She was flying to San Diego for a surgery that would attempt to give her better use of her hands. I learned her story of paralysis and the life she was learning to leave behind. We talked about possible ways she could re-engage that life, even in her different state. She had been an art teacher and couldn’t hold brushes to be able to show the kids how to paint. I suggested some alternative perspectives that she said she appreciated. I could tell she hadn’t accepted it wholly yet, and I understood. I’m not sure I’ve accepted Catherine’s situation wholly yet either. I gave her my card and asked her to email me and let me know how the surgery went. I’ve still not heard from her, though I hope I do. Even in our short 5-hour flight, she made a difference in my life, too. Brian and I are just back from a wonderful respite weekend away to National Harbor and Old Town Alexandria. We try to time our respite weekend over our anniversary, and this year hit perfectly. Sunday, we celebrated 18 years! The trip was perfect in every way. Good food. Lots of laughter, which we don’t seem to have time for in our day-to-day lives. And great sleep in the Westin Heavenly bed. Say what you will about the Gaylord, but I sure like the Westin beds with all their fluffy decadence. They provided the perfect backdrop for Brian and me to reminisce about our wedding day. It’s amazing what you forget… but more amazing what you remember! We came home to find the babysitter relaxed holding Catherine. Sarah was on the computer playing games on the Sesame Street site. Have you seen that one? If you have a toddler, take a look. It’s fantastic. All seemed right in the world, and we were so relaxed I just felt tired. I even told Brian on the way home, “I’m not sure I like being relaxed. It just makes me feel tired.” But maybe that’s what normal feels like, and I just don’t realize it. We invited Lori to stay for dinner and had a cheerful meal of hotdogs, tater tots and pears on the deck on a cooler-than-usual late May evening. I really did think my life was perfect in that moment reflecting on our weekend together. Brian put Catherine to bed, and Sarah and I had what has become a tradition of milk and cookies on the sofa before going to bed. We each drifted off to sleep quickly. I suppose being “relaxed” will do that. I woke this morning to find Catherine on the sofa. I looked at her and thought her face looked a little waxy, but I figured her allergies must have been a problem so the nurse brought her to the sofa to help her settle. Every time I walked past, I thought, “Something doesn’t look right.” But she was sleeping hard, so I chalked it up to allergies. When I got report, the nurse asked if I were up for the seizure. “Crap!” I thought. She’d had a seizure at 10:30 PM and Brian dealt with it alone. I hate that for him. I hate it worse for Catherine. What “didn’t look right” was her body drugged with Diastat. I marked it on the calendar where we track them and found our old neurologist’s info online. He’s moved to Hershey, PA, and I think we’re going to need to go see him. Reality hits hard when your relaxed at 7 AM on a Monday morning. 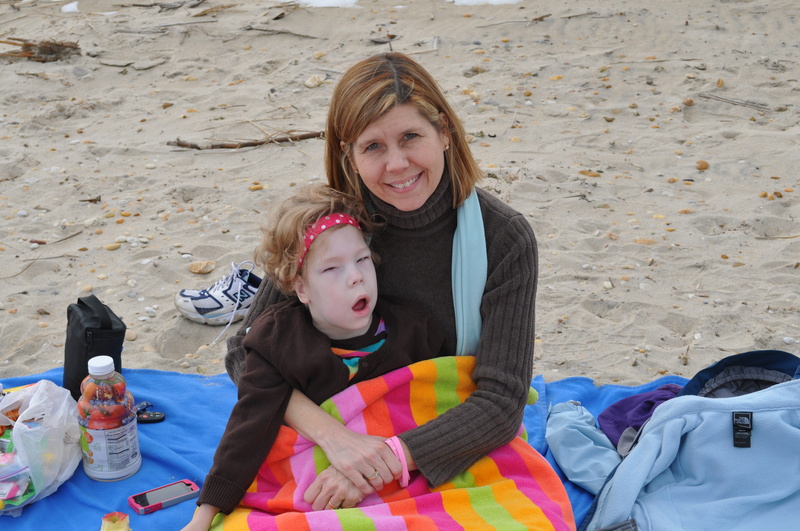 I recently read a blog post from a woman about what not to say to a parent of a child with disabilities. I recalled thinking after I read the post – and I actually replied to it myself – that I didn’t feel the way she did. In fact, I like it when people ask me questions about Catherine. It’s more honest, I believe. And I prefer to deal with things directly and then get past the discomfort but at least have the authentic thinking and feelings and questions out there. But just this week, I learned what not to say to the parent of a kid with disability. Catherine has a double ear infection and a busted ear drum. “Perforated” is the medical euphemism, I believe, but the reality is that it’s busted. I ache that we missed it. One of her caregivers noticed green fluid coming from her ear, so Brian took her to the doctor. She’d had a fever for 5 days, but with all the flu and cold in our house this winter, we just thought she was simply running a bug. Ugh! I feel like the worst mom ever. When Brian told me about the diagnosis as I drove home from work, the first question I asked him was, “Will it affect her hearing?” He said the doctor said not, but since she is already so sensory deprived, that answer didn’t really satisfy me, and it won’t until I see that she responds the same to sound over time. So even though the doctor says not to worry, I’m not so sure. The nurse proceeded to tell me a story about himself incurring an ear injury after firing a shotgun and experiencing some hearing loss. “It was permanent,” he said. He must have realized what he’d said because he added, “But only at certain frequencies,” I suppose thinking that might make me feel better. Don’t tell the mom of a child with severe disabilities about your experience losing the very thing she hopes her kid doesn’t lose. Even if it only happened to you just a little bit. Catherine and me on New Year's Day. I’m not suggesting I want to change anything about my life. But if I knew my life was going to be what it is, I might have followed my natural interest in science and headed to med school to become a neurologist. We had to see Catherine’s neurologist this week because she’s started having what we call “episodes.” That’s probably a euphemism for seizures, and we may just be in denial about it. I’m ok with that. When researching Catherine’s most recent EEG (the test they do where they hook little electrodes to your scalp that read your brain waves), she had more normal activity on the left side of her brain. I said, “Well that makes sense because she’s more active on the right side of her body, Delrey identified her right foot works the best for pushing switches and learning communication. But – her brain bleed was far worse on the left side! So much so that her VP shunt is placed on her right side because that was the better side according to her MRIs. Maybe I’m the only one this fascinates, but it is completely contradictory. She should have better function of her body on the opposite side of the best side of her brain, meaning the left of her body. And she should have better brain waves on the less damaged side – wouldn’t you think? 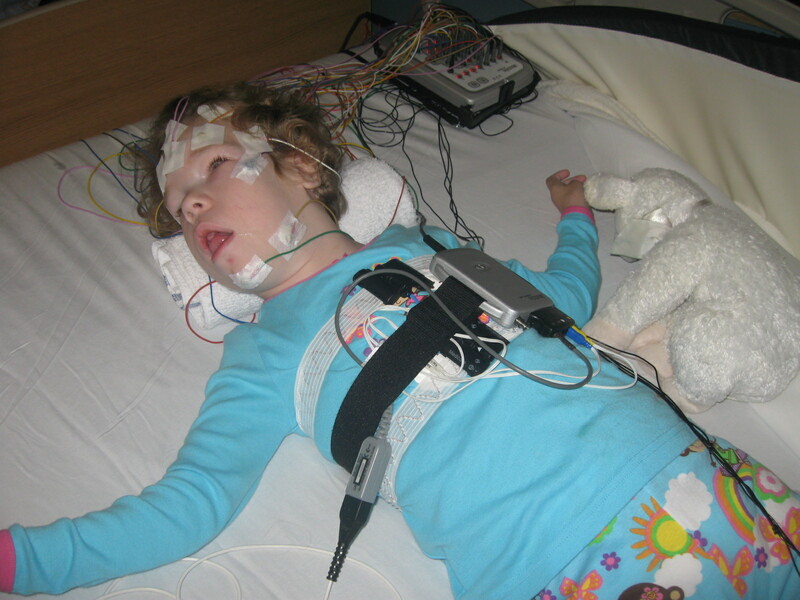 But she has better function via EEG waves in the worse side of her brain. And she controls her body best on the right. Wow! A NICU doc told me they really only started learning about the brain in the 50’s. The territory is so new. I think it’s pretty amazing, and I can’t wait to see what we learn about the brain over Catherine’s lifetime. Maybe some of it will actually be helpful – not just interesting.